This fabulous self catering holiday apartment in Broad Haven, Pembrokeshire,has the lovely blue flag beach right on it's doorstep. It boasts amazing views over St Brides Bay and is furnished to a very high standard. Kitchen: Equipped to the highest standard: oven, electric hob, microwave, fridge, freezer, dishwasher and washer-dryer. The kitchen has a low level oven, dishwasher and washer/dryer, fridge and freezer - all other appliances are at standard worktop height with the exception of the Microwave which is at eye height. Lounge/Diner: Large open plan lounge area (with adjacent dining area). Two french doors leading onto balcony. Facilities 3 seater sofa bed, reclining chair, TV and DVD (the local village shop has a DVD hire selection). A selection of toys are also provided for younger children and wifi via the BT Homehub. Bedroom 1: Double bed, wardrobe, bedside cabinets and TV/DVD. Bathroom: Modern and decorated to a high standard. There is a bath with an electric shower, shaving point, a ceiling mounted extractor fan and heated towel rail. Access to apartment: St Brides Bay View is a first floor apartment right on the sea front at Broad Haven. Access is gained via steps from the pavement to the communal hall entrance doorway. One flight of stairs then take you to the first floor. Heating throughout via electric wall-mounted heaters. Prices include all bed linen and utilities. Guests must provide own bed linen for sofa bed. Towels can be hired at £4 per set of 1 x bath and 1 x hand if required. Travel cot and strap in childs chair available at the apartment. Car Parking Allocated car parking space plus second space in general permit parking area. Sorry, no pets or smoking. NB Although this apartment does not take pets, the owners dog is with them during their stays. As always we thoroughly enjoyed our stay in broadhaven. The view cannot be bettered. The standard of the apartment is exceptional and everything to make it feel like a home from home is there.We will definitely come again. Fourth visit for us, and will be booking again for 2019. Perfectly equipped and with a stunning view from the balcony, the apartment provides the ideal base for a peaceful and relaxing break. Can't wait to get back again, credit also to the Stay In The Havens team for their hassle-free management. It’s the fourth time I have stayed in Broad Haven and still love it. 12 St Brides Bay is a fabulous apartment, very well equipped and beautifully decorated. Having the view out to the sea from the balcony was amazing and we spent many hours just watching the tide come in and out. Highly recommend booking this apartment, it was perfect. We booked our August holiday through Stay In The Havens for two weeks in Broad Haven, Pembrokeshire. The website was informative and user-friendly, and the booking process was efficient. A few weeks before our holiday, the property we had booked unfortunately became unavailable due to flooding, but Karen and the team dealt with the situation promptly and professionally. We were offered a range of comparable properties and were not rushed into making a decision. In fact, we ended up with a beautiful apartment overlooking the sea which we otherwise would not have discovered. We would definitely recommend booking a holiday with Stay In The Havens. We enjoyed our stay very much. The apartment was clean and comfortable and in a lovely location for touring the area – Little Haven, Solva, St. Davids, Nolton Haven. Added bonus was the beautiful view of the Beach and sea from the balcony. Only wish we could have stayed for longer, but we will return. 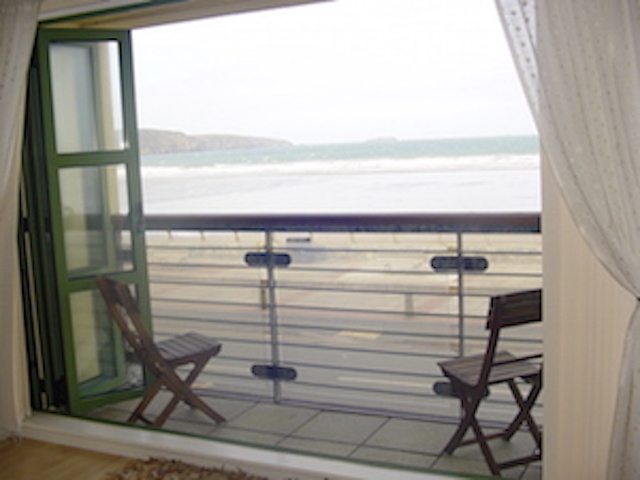 Lovely apartment with a divine balcony view over St Brides Bay, whether in sun or rain. We enjoyed our short break at number 12. We brought along Maria’s parents this time to enjoy the apartment and sea view. They were not disappointed. All clean and tidy and looking good. Hope to be back soon. Despite arriving a day late to avoid the worst of the snow, we still had a great break. The warmth of the apartment was much appreciated after brisk walks! Thanks also to Claire for the updates on local road conditions. Another relaxing and restful stay in Broad Haven. The apartment is just as luxurious and well equipped as we remembered, and really is impossible to find fault with. Despite it being offseason, there is still plenty to do and see, in particular, our favourite pastime of sitting in the bay window watching the world go by. Thanks to the SITH team for facilitating our stay, will be booking again for 2018 asap. We had a wonderful week yet again, the apartment was spotlessly clean and had everything we needed. Lovely comfy bed too. Look forward to our next visit. We had a wonderful few days in Broad Haven. Wonderful views and great beach. The flat was well presented and clean perfect for a family of 4. We did indeed enjoy our stay, as we always do (probably our 10th visit to this property – 3 weeks booked this year alone). The views & local walks are unbeatable. We were impressed to find the flat freshly decorated with a new fitted carpet and numerous other renewals. We assume that the curtains will be returned at some stage? Nice new chairs for the balcony, but now need a new outside table to match so that all the rusty balcony furniture can be removed! The newly refurbished Galleon and the recently opened seafood shop in Little Haven are welcome additions to the local amenities since our last visit. Well, back again to one of our favourite places. The flat is still lovely and comfortable, views still amazing. Weather been ok, Ron has more of a tan this time! Looking forward to our next trip/stay here. Hopefully, we will take our Grandaughter back, she was only 2 but enjoyed it then, so now 6 years old, I think she will love it more just like we do every time we come here. We thoroughly enjoyed our 4 nights at no. 12 and we were lucky to have some really warm days. Having the French windows open whilst enjoying an evening meal looking out across the bay was so wonderful. We very much hope to return. Enjoyed a comfortable stay in a lovely apartment - we have stayed in Broad Haven a number of times but the balcony in No12 wins the prize. We are very grateful to both Karen and Claire for their help and support. Another great stay, love the location, weather wasn't so good but with a view like this who cares. Had a lovely night in the Ocean Bar. Met some of the locals. This was our 3rd stay but not our last. Thank you. We have had a wonderful short holiday at this fantastic apartment with its stunning views. The weather has been brilliant. My grandson (9 yrs) has enjoyed making sandcastles, lovely surfing, rock pools and kite flying. He has always longed to go on a roller coaster (mum, dad, grandma to scared) and his big cousin from Fishguard took him to Oakwood on the only cloudy afternoon - roller coaster heaven! My daughter loves dogs and has enjoyed watching them on the beach and the first evening here, to her delight, her dog watching helped a missing chocolate labrador to be found. She and i have enjoyed the amazing sunsets - gazed in wonder from our balcony. My son-in-law has appreciated the short stroll for his newspaper and watching the footy in the pub. They both enjoyed a nostalgic trip to Tenby where they had a holiday when they were first married 15 years ago. It has been lovely to spend time with my brother from Fishguard where we are going today - visiting Pembroke Castle en-route. In the evenings we have played draughts and monopoly - great to see my granson away from his x-box! We go home tomorrow - talking about when we return. We all vote Broad Haven the best family holiday place ever. Once again a lovely break in our favourite part of Wales. Weather been up and down but we have managed to do the things we planned. Just nice to relax in this lovely area and apartment. Looking forward to our next trip here! Lovely apartment in a great location and what a view! It has been the perfect base for us to complete the glorious Pembrokeshire Coastal Path between Newgale and Milford Haven, leaving the car and using the excellent local buses that service the track. There have been more dramatic and spectacular views which have been enhanced by the superb wild flowers. We have hiked on many coastal tracks around the world - New Zealand, Australia,South Africa etc and this track certainly ranks with the best of them. The weather has been very good all week, lots of sunshine, no rain but quite chilly for this time of year. We have enjoyed meals in the Ocean Restaurant, Eva's Bistro and the Castle Inn at Little Haven and would recommend them all. Had a great day on Skomer on Thursday - lots of sea birds and a couple of seals but sadly not many puffins - too early in the season for sightings. Finally, how could we forget the stunning sunsets - holidays don't get any better than this!! Had a lovely time.......interesting summer temperatures!! One of the best places we have ever stayed in! Very well equipped and tastefully furnished flat with a wonderful view. The 'wow' factor would be further enhanced if the rust chairs on the balcony were removed and replaced with new ones. broad Haven is very well situated with a clean and beautiful beach as well as having friendly people. Would certainly recomment this place to our friends! Arrived to collect Luke. I had an op over Easter and decided to come 'home' to recuperate! Saw the Aldred's which was a bonus. Andrew, Mark and kids went 'mountaineering' over Lion Rock and kids ended up on top of the triangle rock which can be seen from the flat. Sea is extremely calm for this time of year as easterly wind predominated. Real sunny days which have apparently lasted here for 2 weeks. Its been great for me to recuperate looking at the sea and sunbathing with the balcony doors open. We love our flat! x. Wonderful view - always something to look at even on the coldest of days. Enjoyed our stay very much. Lovely apartment. View second to none! A couple of lovely days, dry clear and sunny. Beautiful sunsets from the window. Went to St Davids on Saturday where they were still celebrating St Davids Day. We joined in the cawl tasting competition, enjoyed the live music and the whole lively atmosphere. The cathedral is breathtaking. There's so much to see and do around here, we'll be back soon. We enjoyed a very good meal at Eva's Bistro. Another lovely winter break in Broad Haven. First time in this flat which is extremely comfortable and well appointed. The view over the bay is amazing. Hope to return again soon. Recommend the Ocean for excellent food and service. Once again a lovely stay, weather has been good and have enjoyed some great walks again. We counted 11 seals in the bay at Martins Haven. Enjoyed lovely food at the Ocean and also St Brides Inn at Little Haven. More seals have been seen at the Blue Lagoon, Aberridy - then we found a family of 5 at Porth Egr, a small bay on the coastal path from Aberridy to Porthgain. Wednesday night saw one of the highest tides ever seen, pebbles all over the road and the small brdige collapsed in Broad Haven. Little Haven was even worse, people putting sand bags at their doors as the waves were so high! Looking forward to our next trip here, it is just a fantactic are and place to stay!! First impression on our 3 year old son - I love this holiday home. Set his bedroom with his toys, closed the door, enjoyed every minute. The apartment is lovely and clean. Thanks for making it so comfortable for us after 5 and 3/4 hour drive. Feeling sad to be leaving but we have to work and come again hopefully. Thanks. Enjoyed out week despite the weather being a little disappointing! We got out and the boys loved the surfing, tried various beaches, pubs etc - all enjoyable. The apartment was very nice, comfortable but, most of all, in a 'fab' position. I shall miss sitting on the balcony of an evening and admiring the view and peace and quiet! Would return. Enjoyed the Olympics - some great moments! Walked up to the Druidstone Hotel - as suggested - and had coffee and welshcakes served by (as you also said) the lovely staff! We managed to get 3 days on the beach - 2 at our favourite - Marloes Sands and one in Tenby. A full day walking around the Dale peninsula (thoroughly recommend this walk - its our second time doing it and its a winner...) adn back for beers/sunset on the balcony. We'd love to come back sometime. It was Olympic week as well. An excellent apartment with all amenities and a superb sea view. Hope to be back soon. Our 3rd visit to these lovely flats, lovely position and well equipped. The weather wasn't brilliant this year but we still did lots of enjoyable trips out into the fog! Nice just to relax. Copyright © 2019 Stay in the Havens. All rights reserved.